He finds them problematic. 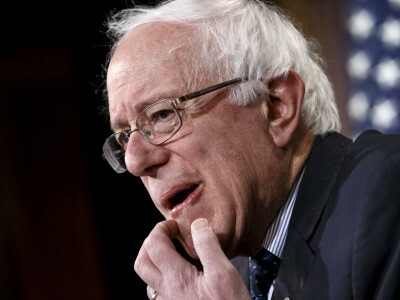 In his exact words to CBS’s Face the Nation, Bernie Sanders suggested that, “The whole concept of superdelegates is problematic.” Such an alignment of interests again shows how peculiarly undemocratic aspects of the process selecting Presidential candidates can be. The superdelegate issue, termed in political-speak “professionals”, arose largely as a corrective measure to other delegates not necessarily representative of the Democratic voter base in terms of education, income and occupation. The Hunt Commission, chaired by Governor James B. Hunt in 1981, insisted on the increase of professionals to make delegates more representative of the broader Democratic electorate. That strange political species known as the superdelegate was born. The regulations in becoming such a delegate suggest false sagacity. Understandably, they are designed to anchor the party in the realms of experience. As ever, the establishment looms large: Democratic governors, senators and House of Representatives get a spot. Democratic National Committee members qualify. A third possibility is via the issue of being prominent: former presidents, senate or house leader, DNC chair and so forth. Their strength lies in volition and choice: they are entitled to vote for whichever candidate they wish irrespective of the primary results. The point is worth emphasising, given that superdelegates were the favourable pool Clinton was hoping to cultivate in the contest with Barack Obama in 2008. The superdelegates in this situation are the grand stumbling blocks on an already cluttered political road. “Bernie Sanders,” suggested Anthony L. Fisher last month, “has a superdelegate problem.” But it is not merely his problem. It speaks, more broadly, to a patrician ordering of Democratic politics. This puts Sanders at a disadvantage, being, as he is, unregistered as a Democrat, and one without the deep pull the Clintons have within party politics. The party apparatchiks and former office holders are invariably going to favour one they see as a mirror of themselves, a reliable establishment figure. (We can leave the trust element out of this equation.) It might even be more accurate to term the Clinton influence over the Democrats as a virus that refuses to dissipate. Sanders, being acutely aware of this problem, has attempted to sway a few supers down his way, suggesting that “it might be a good idea for superdelegates to listen to the people in their own state.” Where he had won by a good margin, they should be convinced that he was their man. Sanders continues gnawing away at the Clinton machine, netting gains over the weekend that managed to take some wind out of his rival’s campaign. Stunning caucus victories were registered on Saturday in Alaska (besting Clinton by sixty-four percentage points); Washington (forty-fix points) and Hawaii (forty points). In doing so, the last week saw Sanders pick up a hundred and twenty-eight delegates, with Clinton getting seventy-six. This fine net-gain has not gone far enough to rectify the lack of pull Sanders had in the southern votes earlier this month, including the defeats of March 15. Fittingly, the electoral contest on odds and bobs has made the issue of who pits the other to the post an important betting subject. With money dulling, numbing, and stripping the US political system of worth, getting a wager on a candidate seems minor fare. Betfair, by way of example, is an online site which enables the punter to stake a hundred dollars to Clinton getting the nomination to Sanders’ ten. Nice odds if you win betting against a Clinton presidency, but hardly in the spirit of commonweal maturity. The reductionist tack in approaching Sanders and his overall chances can prove self-defeating at several points. Political pundits, and the betting fraternity, are notoriously unreliable when it comes to such things. They have misunderstood, and misread, the mood behind the Vermont senator’s campaign on numerous occasions. Will superdelegates do that same thing? Irrespective of the maths involved, the looming questions remain how those superdelegates, enormously favourable to Clinton, will behave, and ultimately, how a Clinton nomination will approach the Sandernistas. Managing the latter will be a tall order.